Welcome to Pop The Question, a weekly space to dissect every aspect of wedding madness. Each Tuesday, we’ll ask a question (sometimes there might even be a poll! ), you’ll share answers and stories, and then we’ll bring you the best of the bunch on Thursdays. You’ll laugh, you’ll cry, you’ll fly into a total rage over something that doesn’t actually matter … it will be just like your wedding day. 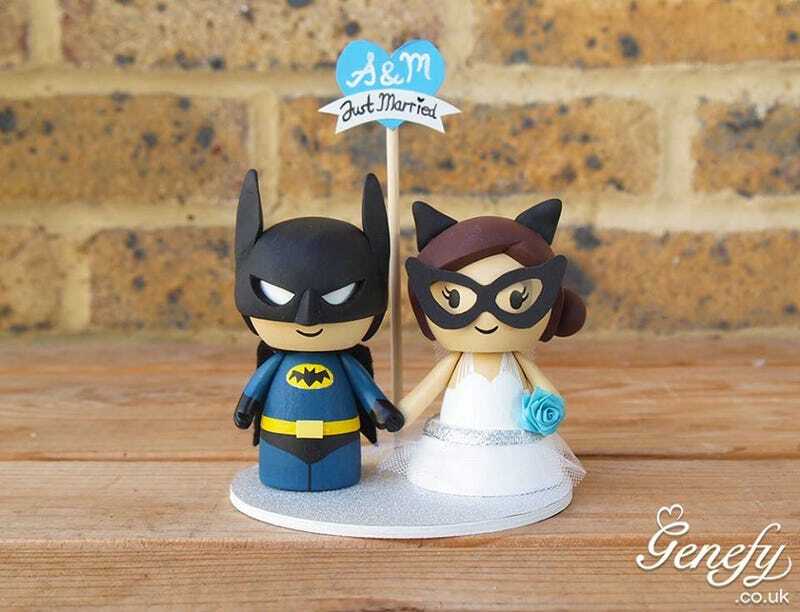 That’s Nerdalicious has a round-up of British concern Genefy Playground’s pop culture-inspired wedding cake toppers. Couples can pick any characters they want, in any combination (the Batman/Snow White pairing is a touch confusing, but they do say, after all, that opposites attract). As adorable as they are, I bet you can top them. I will not apologize for that pun, no I will not. So let’s see ‘em! Did you go traditional bride and groom? (Or bride and bride, or groom and groom?) Did you have a floral arrangement topper? Was whimsy more your style? Tell us, also, who designed the topper and how much you paid, if you feel up to sharing that information with the group. On Thursday, we’ll meet back here to exclaim over your creative cake choices. Contact the author at jolie@deadspin.com.